Welcome to the TIGHAR Store! You’ll find dozens of ways to participate in TIGHAR’s work here, from memberships to t-shirts. 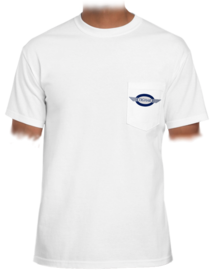 Proceeds from all sales go to support the research and the field work we have done for over 30 years. TIGHAR is a 501(C)(3) public charity. All donations are tax-deductible to the extent permitted by law. 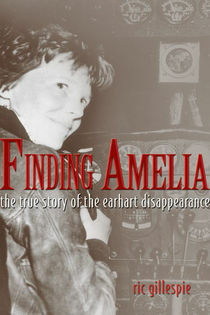 After ten years of negotiations, TIGHAR has succeeded in acquiring imagery that may finally prove whether TIGHAR Artifact 2-2-V-1 is the aluminum patch installed on the Electra in Miami prior to Earhart’s departure on her second and fatal world flight attempt. Now that the imagery is safely rendered in digital format, we can start the painstaking process of forensic analysis. The end product should be a seeing-is-believing comparison between the patch and the artifact that will prove – or disprove – that they are one and the same. If you haven’t used the Store before, you may want to register, set up a user name, and choose a password. If you are a TIGHAR member, and are registered, you should receive member discounts automatically. Discounts don’t apply on all items, but on a lot. The discount is 20%. Items with a discount have a red tag on them in the description. If you are joining TIGHAR as a new member, and want to buy some Stuff as well, get your discount by joining first, waiting about two minutes, and then going back to buy Stuff. That’s about how long it takes the system to update and record you as a member. Just make two separate transactions instead of one. Questions? Problems? Email us: store@tighar.org, or call us (normal business hours Eastern U.S. time): 610-467-1937. 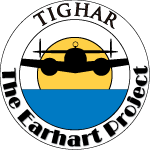 TIGHARNews is our email newsletter. Featuring breaking news, Store sales, interesting history tidbits, and quick links to new information on the TIGHAR website, it is delivered to your email inbox FREE. Just click to sign up.